When Daina Higgins moved to Philadelphia, she began to commute by car for the first time in her life. 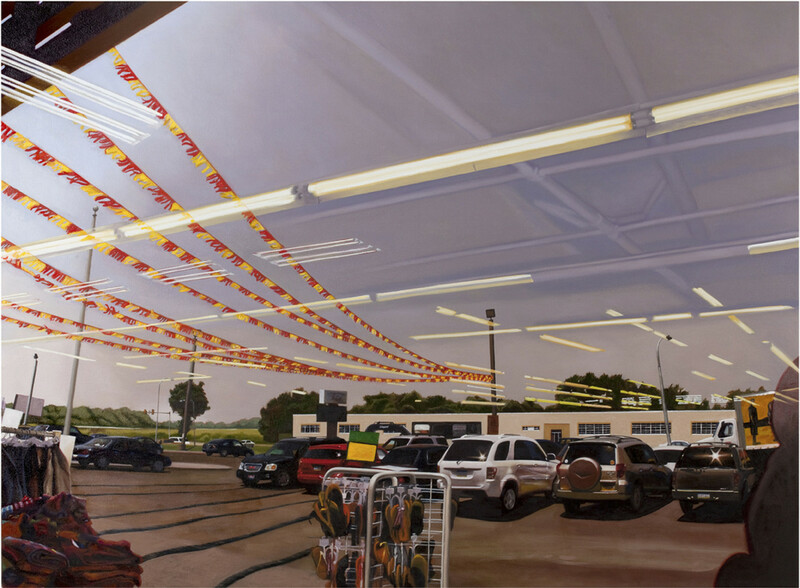 Her daily commutes took her through the inner-ring suburbs of Philadelphia and she began to document the unsung landscapes of Northeast, Northwest, and South Philadelphia in her paintings. As a painter of the urban landscape, her eye is drawn to the “non-places” and “unheroic landscapes” not visited by tourists or beauty seekers. For Higgins, the car is itself a type of non-space within a suburban non-place, where life is reduced to essentials. Still, there is a visual interest in the way light reflects off shop windows and car windshields in the sparkling world of the auto-centric main drag. It is this type of everyday world that is heroic to Higgins. North Philly captures the isolation and contemplation that car travel provides.